If you're a frugivore like me and prefer fresh fruit, trying out (and then planting) storage apples that will go the distance makes a lot of sense. To that end, we bought some Winesaps, Stayman Winesaps, and Arkansas Black apples last fall, put them in the fridge root cellar, and waited to see what happened. The first thing I noticed is that the old-fashioned Winesaps tasted so good, they didn't last out the first month. That's not a comment on their lack of storage capabilities, but on their excellent flavor! 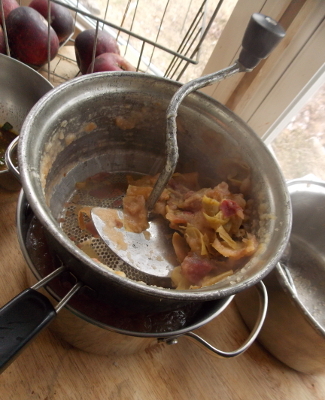 The Stayman Winesaps were my next-favorite in flavor when we first got them, but those apples started to go mealy inside partway into December, and I cooked up the last ones into applesauce this week before they rotted. Arkansas Blacks were a bit of a surprise. When we first bought them, the apples tasted a bit insipid (but crisp). As they aged in the fridge root cellar, though, the flavor changed, becoming more complex and taking on a hint of banana. (I'd always wondered if the apple variety Winter Banana really tastes like a banana, and now I'm guessing it does.) 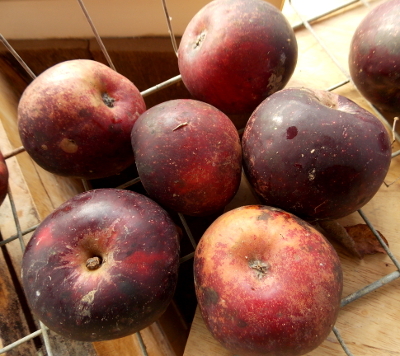 Meanwhile, the Arkansas Black apples have yet to lose any crispness, even under home storage conditions, so around the end of December, Arkansas Black became my favored nibble over the Stayman Winesaps. In case you're curious about other apples that will last at least until the new year, the chart below, excerpted from various sources, suggests some popular choices. I haven't cross-referenced this against my list of disease-resistant apples, though, so be sure to check there before putting in one of these varieties and planning on it being a low-work addition to the orchard. I'd be curious to hear from others who have stocked up on apples in the fall and watched to see which ones made it through the winter. Which varieties do you find last best under home storage conditions? From what I can tell, how long produce keeps is more a function of its nutrient density than anything else. See for example, Jerry Burnetti's latest article on butternut squash in AcresUSA. See also tandjenterprises.com. Both talk about their road towards high Brix produce. Jerry has a picture of two butternut next to each other. One was picked the year before and stored at 'room' temperature. Tom says that nutrient dense produce doesn't rot. So I wonder if the data is more about soil health and minor trace minerals than variety? I am still eating apples from last year. The Macs are best so far. They came from a tree with LOTS of bark mulch nearby. Mostly no bugs! Looks like our little Arkansas Black tree will give us some good keeping apples once it starts producing! On a side note, how should I keep sweet potatoes to keep them, well, keeping? Brandy --- Sweet potatoes are very easy. Just so long as they're not too hot or cold or damp, they'll do fine. I keep mind on a shelf in the kitchen in mesh bags and they keep until the new sweet potatoes come out of the garden the next year. They're one of the easiest to grow too! I seem to have poor luck keeping them. Maybe I'll try a spot that's just a bit cooler.